Construction workers drilling holes for a new overpass on I-5 near Ridgefield, Washington brought up pieces of mammoth ivory this January. 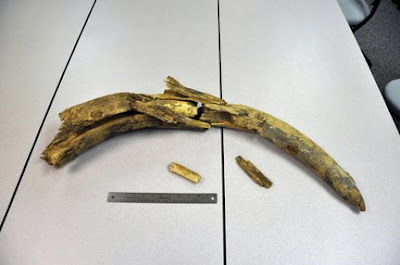 Brad Clark, a Washington Transportation Department inspector, collected the pieces that, when reassembled, formed about four feet of the tip of a mammoth tusk. Mammoth ivory in Washington is nowhere near as common as in Alaska or northern Siberia, but it is not rare either. For that reason, the construction is going ahead without any attempt being made to see if there are more remains to be found. Even without digging up the rest of the remains, this tusk makes a departure point for for some nice educational stories. The mammoth in question is almost certainly a Columbian mammoth (Mammuthus columbi) and not a woolly mammoth (M. primigenius). Columbian mammoths evolved earlier than woollies and emigrated to North America sooner. The simple version of their family tree shows them both as descendants of a common ancestor, the southern mammoth (M. meridionalis), which spread across Eurasia about four million years ago. One group of these mammoths, usually called the imperial mammoth (M. imperator) crossed into North America via the Bering land bridge at the beginning of the ice ages (c. 1.9 mya). The Columbians evolved from the imperials*. Back in Eurasia, the woollies evolved from the main group of southern mammoths. About 500,000 years ago, the woollies emigrated into North America. Both kinds of mammoths went extinct around the same time. In North America, the two types of mammoths lived in different ecological zones and physical regions. The woollies stayed in northern grasslands close to the ice cap and the Columbians lived in a variety of different zones from the edge of the tundra all the way down to the edge of the tropical rainforests in Central America. So far, no woollies have been found west of the Rocky Mountains. The Ridgefield fragments have been sent to the Burke Museum here in Seattle, where Bax Barton will make a final identification of the species. Some mastodons have been found in the Pacific Northwest, so it is possible that the ivory is not from a mammoth at all. What would be frustrating would be if the ivory turns out to belong to a woolly. That would make the find important enough to warrant further investigation, but an administrative nightmare since the decision has already been made to continue working on the highway, which is the main north-south artery on the West Coast. It is unlikely that this mammoth has any great scientific significance. However, if we could know its personal history, we would see that the mammoth's last hours witnessed to one of the most dramatic moments in northwestern geological history. The Oregonian article mentions it rather simply at the end of the article, "The tusk was buried about 30 feet deep in sediments piled up during the Missoula floods." I've written about these floods before. During the last ice age, two ice sheets covered what is now Canada and extended into what is now the United States. The larger sheet, the Laurentian, was centered on Hudson Bay and, at its peak, extended almost to the Ohio River. The smaller ice sheet was a collection of mountain glaciers that grew together to form a single sheet. Geologists call this the Cordilleran Ice Sheet. It only extended to the US/Canada border region. At the end of the ice age, when the Laurentian and Fennoscanian (European) ice sheets began to melt, the changed global weather patterns caused the Cordilleran sheet to lurch south for a couple thousand years befor it too melted. Eastern Washington was just as conservative then as it is now. The local mammoths cited this change as proof that global warming was a hoax perpetrated by elitist ground sloths. The western part of Montana, between the Continental Divide on the crest of the Rockies and the Idaho state line on the crest of the Bitterroot Mountains--an area about the size of West Virginia--is drained by the Clark Fork River. Unlike most rivers in the United States, the Clark Fork flows north. It loops across the Idaho panhandle near the Canadian border and joins the Columbia River in the extreme northeastern corner of Washington. When the Cordilleran Ice Sheet lurched southward, a branch of the ice sheet called the Purcell Lobe pushed into Idaho near the location of the present day town of Sandpoint and blocked the Clark Fork. Behind the Purcell Lobe all of the drainage of the Clark Fork was damned up, eventually forming a Great Lake sized body of water we call Glacial Lake Missoula. When the lake was full, the future location of the town of Missoula was beneath a thousand feet of water. Because ice is lighter than water, an ice dam needs to be about ten percent higher than the water behind it in order to be stable. If the water gets higher than that, it essentially floats the dam off its foundation. That happened to Glacial Lake Missoula when the water was almost two thousand feet deep at the dam. The collapse of the dam was catastophically sudden. The lake pressed against the base of the dam with a pressure of nine hundred pounds per square inch. It took no more than a crack for the lake to get under the dam and tear it to shreds. The collapse only took a few hours. Five hundred cubic miles of water flooded across Eastern Washington tearing up everything in its way. Hundreds of square miles of top soils were scoured down to bedrock. Grass, trees, and animals were carried away. At the Wallula Gap, a narrows where the Columbia River becomes the border between Washington and Oregon, the entire flood was forced into the channel of the river. In the Columbia Gorge, where the river carves its way through Cascade mountains, the flood appeared as a brown wall of water, several hundred feet high, traveling fifty an hour, pushing gale force winds ahead of it. For a brief moment,the Columbia carried several times more water than all the rivers in the world combined. "Age's End" © 2005 Stev H. Ominski. The flood waters arrive in the Columbia Gorge east of Portland. The viewer is standing on Crown Point looking toward Beacon Rock. This is one of an ongoing series of paintings by Ominski. At narrow spots in the river the flood waters backed up forming temporary lakes. Geologists call the lake behind the Wallula Gap Lake Lewis, after Mr. Clark's travelling companion. Another lake formed over the present day locations of Portland, Oregon and Vancouver, Washington. The water that blasted through the Columbia Gorge spread out over the basin where the two cities now sit. About thirty miles below Portland, the river narrows again near a tiny town called Kalama. The Kalama Gap is no where near as impressive as the Columbia Gorge or the Wallula Gap, but it was sufficient to force the flood waters to back up and form a lake. Lake Allison, named after the geologist who mapped it, was about four hundred feet deep over downtown Portland and filled the Willamette River valley a hundred miles southward to the outskirts of Eugene. Fans of the University of Oregon fighting Ducks will be happy to know that Corvallis, home of their arch-rivals, the Oregon State Beavers, was underwater. Lake Allison and Ridgefield, WA. Source. As the water pooled behind the Kalama Gap, some of the vast amount of debris that it carried began to settle. The topsoil of Eastern Washington filled the Willamette valley to produce fertile farmland. Melting bergs from the ice dam deposited rocks that had been encased in the ice. A large meteorite was dropped near West Linn. A mammoth settled to the bottom near Ridgefield. Until the radiocarbon dates are back, it will be hard to say exactly when the mammoth met its doom. The problem is, there was more than one Lake Missoula flood. After the first flood, the Purcell Lobe glacier surged forward, once again damming the Clark Fork, forming a new Lake Missoula, that, about fifty years later, breached the dam. This process was repeated as many as forty times over a 2500 year period. As the ice age ended and the glaciers got smaller, each ice dam was lower than the one before and the flood, consequently, smaller than the one before. However, since the Ridgefield mammoth was found only a few feet above the current level of the Columbia River, it could have been deposited by any of the floods. It's equally hard to say where the mammoth came from. It could have been grazing right under the dam in Idaho when the flood waters caught it. It could have been caught somewhere in Eastern Washington or along the Columbia Gorge. It might have been in the Willamette Valley and been carried to Ridgefield as the waters of lake Allison drained. Or it might have drowned and settled to earth on the same spot. Was anyone there to see the floods and this mammoth's last days? The answer is a firm "maybe." From organic debris in the sediments laid down, the Lake Missoula floods have been dated to have happened from 15,000-13,000 years ago. Until recently, archaeologists had no undisputed evidence of people in North America before the Clovis culture that began around 13,000 years ago. The Clovis people are believed to have traveled down the center of the continent between the Laurentian and Cordilleran Ice Sheets. This would have put them in Colorado around the same time as the last floods. A fine collection of Clovis tools was discovered in Eastern Washington in 1987, proving they did make it into the Northwest, but neither that site nor the last flood have been dated exactly enough to indicate whether this group was around to witness the floods. During the 2002, '03, and '04 excavation seasons a group of paleontologists and anthropologists recovered human coprolites (also known as old poop) from the Paisley Caves in south central Oregon. Radiocarbon dating placed the oldest of the coprolites at 14,300 years old and the youngest at 13,000. The dates make it possible for the poopers to have witnessed any of about thirty floods. The Paisley Caves are two hundred miles south of the Columbia River, so it is also possible that the poopers never made it that far north. 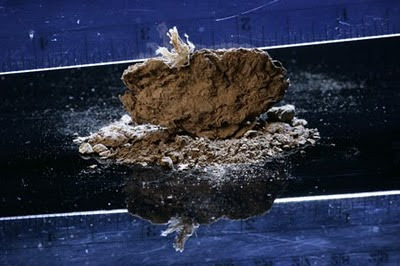 So far, no human remains or artifacts have been found in the flood deposits. For now, whether or not there were human witnesses to the floods is an open question. Finally, did the floods have anything to do with the extinction of the mammoths and other Quaternary megafauna? On this we can be more definite. No. 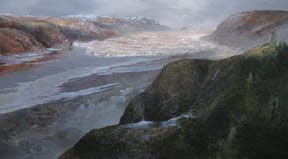 The last floods happened a good thousand years before the generally accepted date for the North American extinctions. Most disputes about the extinction date put it more recently, not further back. Columbian mammoths as visualized by the Czech illustrator Zdenek Burian. One last educational note. It's only appropriate that the Ridgefield mammoth ended up on the Washington side of the river. The Columbian mammoth is the official state fossil of Washington. Over in Oregon, it is the dawn redwood (Metasequoia). Nebraska also claims the Columbian mammoth, but they claim all types of mammoths. If they can't settle on one type of mammoth, I'm not sure they deserve a state fossil at all. * Not to be confused with Rock and Roll Hall of Fame inductee Little Anthony & The Imperials.